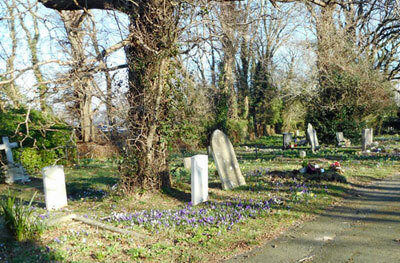 Friends of Newport & Carisbrooke Cemeteries. See more details about the Friends. The aim of the volunteers of the Friends of Newport & Carisbrooke Cemeteries is to clear overgrowth from grave markers and document them together with unmarked burials at Cemeteries in the modern civil parish of Newport, Isle of Wight - the cemeteries covered are Newport, St Paul's (old and current) and Carisbrooke (Mountjoy) Cemeteries (plus the old churchyard at St Paul's church Barton). Other clearing sessions will be arranged on an ad-hoc basis, just complete an 'Express an interest form' to be kept informed. If you would like to contribute to the group, but don't wish, or can't, help with the clearance of vegetation; let us know and we may have another way you can help - you don't need to live locally, transcribing newspaper reports etc. can be carried out wherever you live. Our Newsletter number 7 (February 2019) is now available in our Newsletter archive. If you would like to be sent future issues via e-mail, just send us a message asking us to add you to the distribution. The next planned session will be at Newport (Fairlee) Cemetery, Saturday 20 April (subject to weather etc), meet at the central roundabout 10.30 and we expect to work for about 2 hours. Just turn up, or to be kept informed, by completing an 'Express an interest form'. We now have a list to all those recorded in the cemeteries as having died in the two World Wars - these includes not only those buried here but also those who didn't return home but are recorded on family memorials - see the list. There's more than just clearing vegetation, so if you are interested in becoming involved, let us know you skills/interests using the 'Express an interest form'. Work is progressing on the website; grave position maps have now been added for all the cemeteries. Also more details and pictures are also being added to individual records.